Watch Revenge Season 4 Episode 16 online now because Margaux LeMarchal is BRINGING IT in this massive game of revenge against Emily. Margaux is out for blood on Revenge Season 4 Episode 16. Watch Revenge online now to see how far she's willing to go to take Emily down for Daniel's death. It's the Fourth of July in the Hamptons and Victoria isn't throwing the annual party. That honor is going to Natalie who has usurped Victoria's position as the town's social chair following her arrival in the Hamptons. Victoria loses in their first round of court and fires Lyman, sending him looking for another avenue for campaign financing. He goes crawling back to his sister talking about forgiveness and connection and family and Louise falls for it. Without telling Nolan, she allows Lyman to stay at their house. Nolan and Louise bicker like an actual married couple. He forgets to wear his wedding ring and she doesn't like it. Jack asks if their marriage is still fake and Nolan responds that it's tricky. Emily warns David about the dangers of getting into bed with another Grayson and David dismisses her concerns. Victoria tells him Natalie cannot be trusted and he tells her to stay out of it. Later he learns both women were telling the truth. 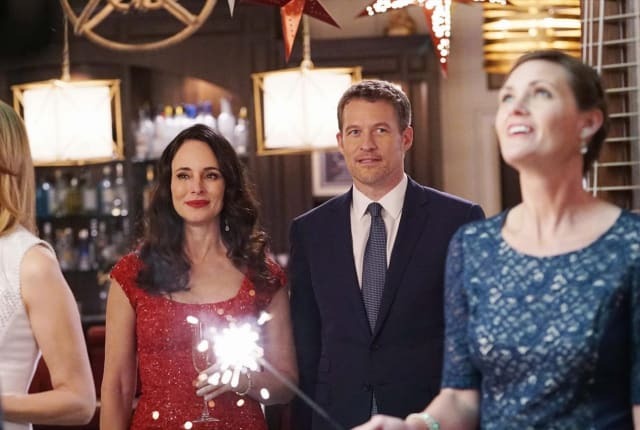 On Revenge Season 4 Episode 16, Natalie throws an Independence Day party in order to bask in her wealth. She also asks David to be her date for the event.